There is a movement going on right now that I really love. It’s a movement that is stepping away from giving gifts that are materials and instead investing in life experience gifts. This means so much to me because when I think back on my childhood, I remember some of the toys that I had but mostly I remember who played with me. I remember surprise trips to a hotel for the weekend. More than Halloween candy I remember my dad playing an old spooky cassette tape int he car while we drove down a dark dirt road through the woods. Those experiences will be with me for as long as my memory can hold them. Every single possession I own may be gone but those memories, those life experiences will stay with me. 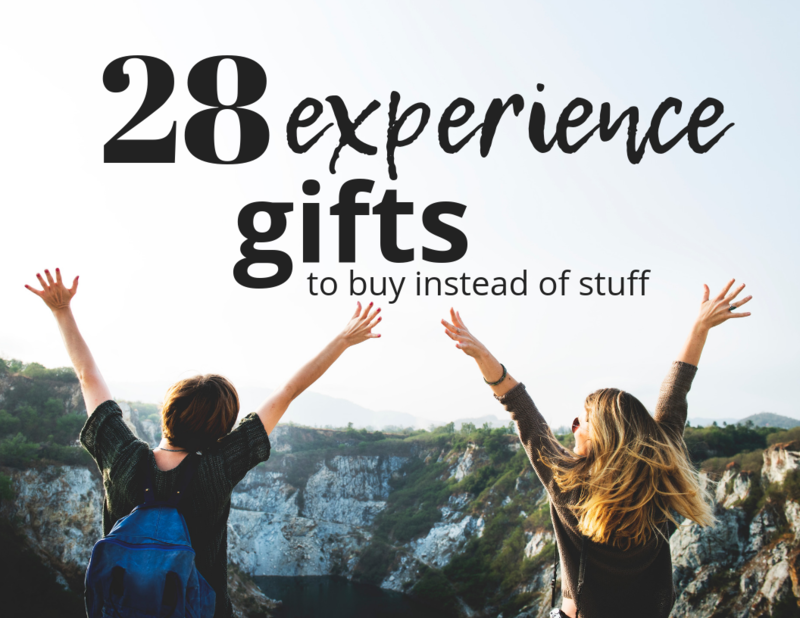 That’s why this list of 28 unique life experience gifts you can give instead of buying stuff is so important. If you didn’t already gather what exactly an experience gift is it’s this: using your money to give someone an experience gift for their life rather than purchasing them an item. Some experience that will enhance their life and bring a smile to their face. You know how people make bucket lists for their lives? Most of the things on those lists have nothing to do with stuff. Help someone you love add something to their bucket list this year. Whether it’s for Christmas, a birthday, Mother’s Day, Father’s Day…any single excuse you have for gift giving, consider experience gifts instead of buying something from the store. Why are experience gifts better than stuff? We only get one life. When I was 6 I wanted a My Size Barbie. I didn’t understand that by the age of 8 she would be out of my life forever more than likely. I would get bored of her and she would end up getting donated. What I won’t forget is spending hours putting on my own plays. I won’t forget going sledding with my dad or camping with my mom. None of these things have anything to do with material possessions…except that perhaps they were held back by them. Our life experiences matter. Our lives matter. Can you still get discounts on experience gifts? Don’t worry, I wouldn’t create a list of life experience gifts without telling you how you can still save money and stick to a budget! There are 5 places I always go to when it comes to saving on experiences in my area or on vacation. Ebates – Before you go anywhere, do anything or buy anything, see if you get Ebates discounts first! They offer discounts on a variety of stores, hotels, travel sites and so. much. more. Plus, you get $10 when you sign up! Do$h – With most rebate apps, you have to browse and select your discounts. With Dosh, it pays attention to your spending and automatically refunds you on any qualifying purchases you make. This is a great way to get money back without actually having to do anything! Get $5 to sign up with Dosh. Groupon – Is there any better way to save on local excursions and classes then through Groupon? I often base my experience gifts solely on what Groupon has to offer! See what they have near you! AirBNB – AirBNBSign up for AirBNB and get $40 off on meI cannot tell you how glad I am that hosts are around! Not only can you usually find an AirBNB at a major discount, but having access to a kitchen makes a trip so much more affordable because you aren’t forced to eat out for every meal! My absolute favorite experience gift to myself or those I love is the gift of travel! Traveling together and experiencing different places, people and cultures is what life is all about after all! I always browse places like Google Flights or Expedia to find the best discounts on flights. While you can sometimes find great vacation packages on Groupon, it’s rare that they also match my date and fly out of my airport. Depending on your vacation plans, it might be worth it to get yourself a rental car. I just got one on my own for the first time and it was the best choice financially by far! When it comes to car rental Booking Buddy is a great place to start! They have rental cars starting at only $8! Like I mentioned earlier, AirBNB is a great way to get everyone you love together under one roof at an affordable cost! After you’ve booked your flights, I highly recommend checking out all of the AirBNB options in the area! Some of them are really unique! Gift cards are every experience gift seekers dream. Right? You give them money so they can do exactly what they choose with it. Even if it means they spend all day at the mall buying stuff…they are still out and about getting a little life experience and some light exercise. Remember to always check Restaurant.com for great deals on local dinning. You could also earn totally free gift cards with survey sites like iSay. Did you know with a company called Blurb you can quickly and easily make your own books…even novels! If you have a person in your family who loves to write, this might be the perfect way to allow them the chance to get their work in print! Everyone loves a good night out bowling, right? Groupon always seems to have great discounts on local bowling alleys so you can easily spend an entire day together! Do you have a painter in your family or are trying to find an fun life experience gift for you and your significant other? See if there are any paint nights near you. There are usually a lot of local places that are willing to supply food and drinks along with a full tutorial on how to paint your own beautiful painting. This is also a great gift idea for parents to give their grown children and spouses! How fun to get everyone out for a night! To find other fun excursions in your area checkout Tours4Fun! You can use this when you’re on vacation or just check out local tour experiences that are happening near you! I have to admit, I still have not experienced an escape room which is shocking because they are crazy popular these days. Because you have to work together to escape a room filled with puzzles, riddles and mazes, it’s a perfect experience for a family! While this is still a gift that comes with “stuff” is also comes with a ton of beneficial knowledge for those little ones in your life. Little Passports is a great learning site that will send our child(ren) monthly kits to learn about different topics. You can choose from early learning kits that teach about things like animals and music. There are also ones for learning about each state in the US or even different countries around the world. If you have a scientist in your life, then you’ll want to jump on the science kits! See all available options! If you have an older kid who loves sports, why not look into a lesson from a professional!? Yes, I mean an actual pro athlete! Learn basketball tips from Steven Curry with MasterClass! It’s online, affordable and would be such a great way to make your child feel like they just got one on one tips from one of their role models! Plus, you don’t have to drive them anywhere! Chances are you are already buying your little ones healthy snacks throughout the month. Sometimes knowing what to buy kids that are healthy for their growing bodies can be tough. Urthbox is a great company that does all of that health research for you! You can get an Urthbox snack subscription and your kiddo will get healthy, new, fun snacks delivered to their door every month! What kid doesn’t love getting a package in the mail? The best part is you can sign up right now and get a box totally free! Maybe I am the only mama who has kids that re totally obsessed with eating? I mean, they literally eat me out of house and home every. single. day. Love with Food is another subscription healthy snack box company but they have a twist! With every box purchased, one meal is donated to a family in need! This is such a great gift to give to now only your kids but to other kids who need some help. Does your child have a gluten allergy? No worries, Love with Food has you covered and you can actually get 25% the Love with Food Gluten Free Snack Box. I guess I am sticking with the food theme! But, one of the things I have wanted to do for my children is teach them how to cook for themselves! That has meant flipping grilled cheese, making scrambled eggs and helping with mashed potatoes. Thankfully there are companies out there like Kid Stir that takes all the guess work out of cooking for kids! They have put together awesome monthly subscription boxes that give your kids all the tools and instructions they need to make some of their favorite dishes! They have ones that focus on soups, breakfast, dinner, appetizers and even drinks! Checkout all the options. My daughter did a monthly subscription to FoodStirs last year and we absolutely loved it! FoodStirs is a company that offers organic, naturally colored baked goods. You may have even started to see their products lining the isles of your grocery stores! What you probably didn’t know is that they have this awesome subscription for kids! We have made pirate ships, flower pots and even their famous donuts! See all subscription options! Hellooooo dream come true! Any fellow wine lovers will adore this present! The Wine of the Month club is real folks. You can purchase a subscription or send some wine as a gift! Either way, this is a fun, adult way to test out some new wine! Similar to Wine of the Month Club, Vinebox is another great option for those wine lovers in your life. These wines arrive every 4 months and you get a great sample size of different wines. I personally think this is a great option for couples with small children. It’s tough to get out of the house to do fun things like visiting vineyards or even going out to eat when you’ve got little ones at home! Encourage a young couple to spend some time together sampling different wines a few times throughout the year and they don’t even have to leave home! Just like the kids, cooking classes are a good idea for adults as well! You can always browse Groupon for local cooking classes in your area, or you could pop open a bottle of wine at home and get a cooking class from some of the pros! I mean how cool to give the gift of a class from your favorite chef? It seems these days more and more people are getting into photography! For that photographer in your life, you might consider getting them into some local photography classes or again, getting them in on a class with a pro like famous celebrity photographer Annie Leibovitz. If there is a local concert or show in your area that you would love to gift to someone, check Seatsforeveryone.com for the best and most affordable tickets around! What a fun way to have a unique experience and get to see a band or a show that you have been dying to see. So we’ve covered the wine lovers in your life, but what about those who have a soft spot in their hearts for beer? Why not give the gift of the Beer of the Month Club from Craft Beer Club! This is such a great way for that beer enthusiast in your life to sample different beers from different breweries from around the country without having to go any further than their front door! Nothing says “I love you, mom” like a spa day. Treat the woman in your life (mom or spouse) to a full treatment spa day. There are a ton of Groupon options out there for different discounts in your area. Just make sure to check reviews! If you’re going to treat her, make sure it’s at a high quality location! If you live in a cold state like we do here in Minnesota, there is no better gift than the gift of a car starter! During those cold winter months people will adore the experience of not freezing to death having to go outside to start their cars. Believe me. Maybe fitness classes don’t sound like the greatest gift in the world but they could be a great chance to try something new and do it with a friend! There are so many great fitness classes these days like hot yoga, aerial classes, pole classes, dance classes. You name it, they’ve thought of it. Check Groupon to see if any fun classes stand out in your area. Whether you are a man or woman a day where you are treated to a mani/pedi together is always a relaxing way to spend the day. Again, this may not be an adventurous life experience, but how much more could a person in your life do if they didn’t have to stress about deep cleaning their house? If you know someone who is overwhelmed at this time in their lives, this may be the exact gift they need to calm their souls and raise their spirits. Sure, I’ll end on this note. Why not. Now, I know this gift isn’t for everyone, but you don’t have to be a hunter or a “gun nut” to have fun being outdoors at a shooting range. Whether it’s a stress reliever, fun practice or just an unique experience you’re after, this might be the ticket! The most important thing about gift giving is making sure you are buying something perfect for the person you are giving the gift to. Maybe they love unique experience gifts or perhaps they just really want that new KitchenAid they keep talking about. No matter what, it’s important to think about the person receiving the gift. If you don’t, you run the risk of spending money on a gift that may never be used. Also, I am a firm believer that there is so much more out there than just giving gifts. Life is short and there is no better present then just spending time with the people you love the most. That’s something anyone can do, even if you’re flat broke! I love all these ideas! I also believe experiences are better than possessions. Going yonpin this for future gift ideas, thanks!